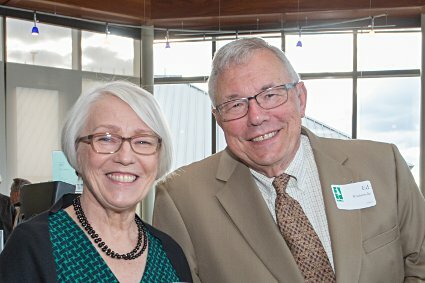 TRAVERSE CITY — Longtime Dennos Museum Center supporters Dr. Edward and Sharon Rutkowski were named the 2018 recipients of Northwestern Michigan College’s highest honor, the NMC Fellow award, by the college’s Board of Trustees this month. The Traverse City residents are founding donors to the Dennos Museum Center, making a planned gift commitment for the Thomas A. Rutkowski Discovery Gallery (named in memory of their late son) in 1992. Sharon was instrumental in helping the Discovery Gallery come into being as a member of the Grand Traverse, Leelanau, Benzie County Medical Society Auxiliary, which helped fund the initial gallery concept. It has been a popular part of the museum since the beginning, especially for families. Concurrent with the new expansion of the Dennos, the Rutkowskis again made a significant contribution to upgrade the exhibits of the Discovery Gallery, which are now being implemented, assuring that it will be an ongoing part of the Dennos for many more years to come. “We are pleased to help give children a fun introduction to the Dennos Museum and hope to expand their appreciation of the arts and their community,” the couple said. Beyond the Dennos, the Rutkowskis have supported the college since 1984, and have given consecutively for the last 27 years. They are also loyal attendees of the annual Lobdell’s Scholarship dinner, supporters of Munson Medical Center, where Dr. Rutkowski was a trustee for 25 years and a general surgeon now retired, and the Leelanau Conservancy. Sharon was the French teacher and a trustee at The Pathfinder School and co-founded the Young People’s Theater Series in 1976. She currently continues to help bring affordable live theater to Grand Traverse area children. The Fellow is Northwestern Michigan College’s highest honor, awarded annually since 1964. Fellows may be nominated because they have demonstrated influential networking on behalf of the College, have demonstrated a pattern of outstanding financial or personal time contributions to NMC, or as a retiree of the College continue to contribute back to their academic or professional fields as volunteers, mentors or advisors. Exceptional contributions in one or more of these areas may justify nomination. See a list of past recipients.